MONK COMICS. 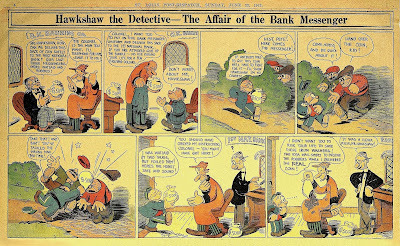 Gus Mager’s comic strip Hawkshaw the Detective ran from February 23, 1913, to September 24, 1922. 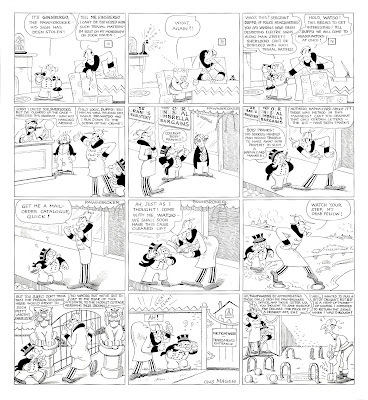 The strip was a continuation of Sherlocko the Monk which was one of a number of alternating characters — Knocko the Monk, Braggo the Monk, Rhymo the Monk, Colfeeto the Monk, Tightwaddo the Monk, Henpecko the Monk — in an earlier series of Monk comics which ran from 1904 to 1912. 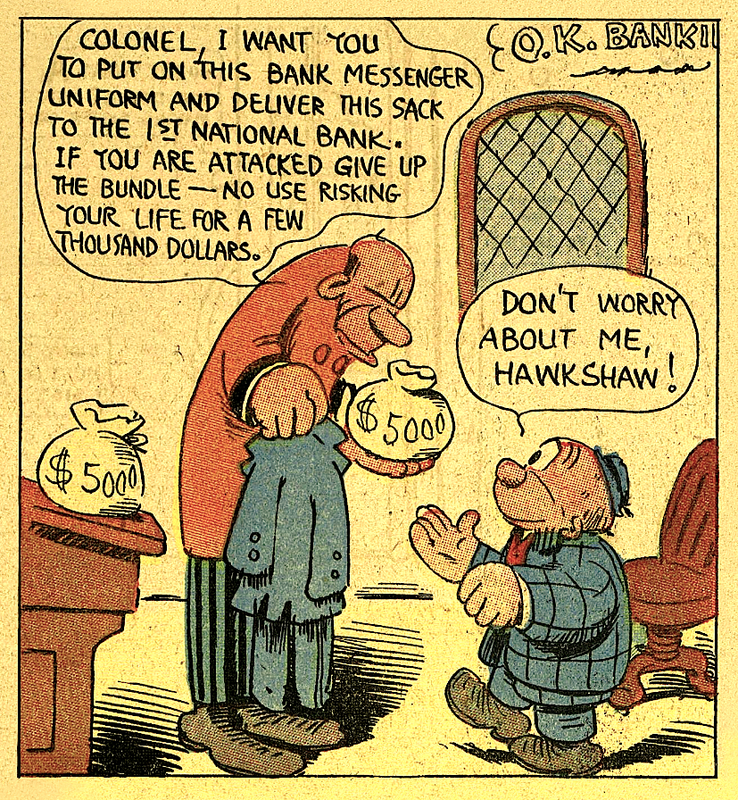 Sherlocko starred in a Sunday page which was renamed Hawkshaw the Detective in 1913. 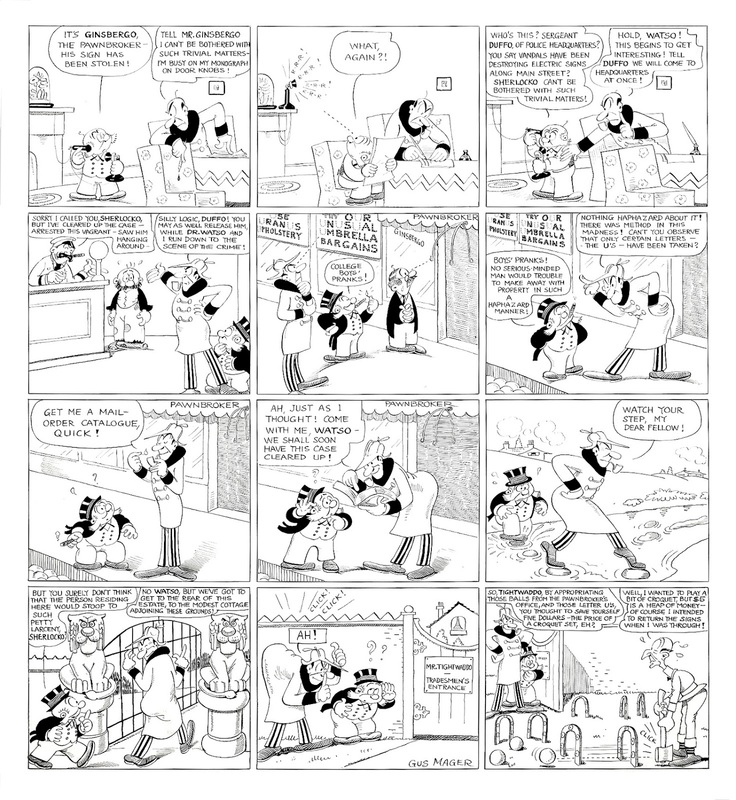 The strip was revived between 1931 and 1952. 1912  Sherlocko the Monk. The Adventure of the Flying Rumor, July 24. 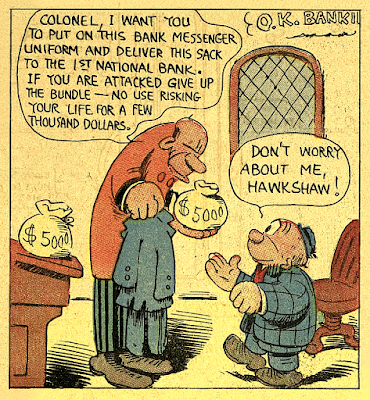 1913  Hawkshaw the Detective – The Affair of the Bank Messenger, June 22. 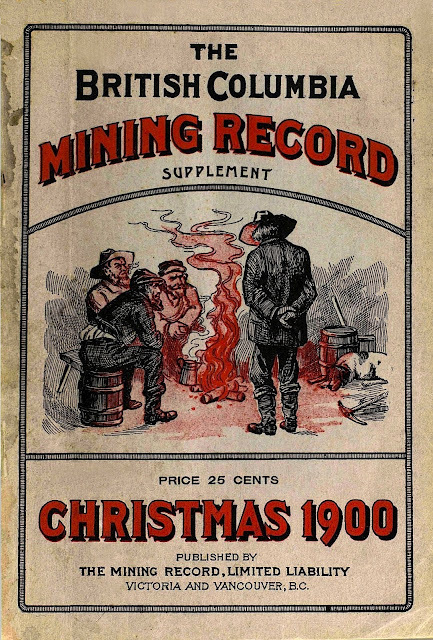 1892  Advertisement in The Miner, June 18. 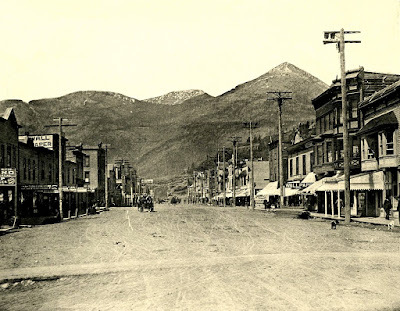 IN 1886 two American men named Hall and Oakes, from Colville, Washington, found copper-silver deposits on Toad Mountain, near Nelson, British Columbia, setting off a rush to the West Kootenay that attracted miners and fortune-seekers from Eastern Canada, the U.S. and Europe. In 1887 the two men staked out four claims called The Silver King, the Kootenay Bonanza, the American Flag and the Kohinoor. 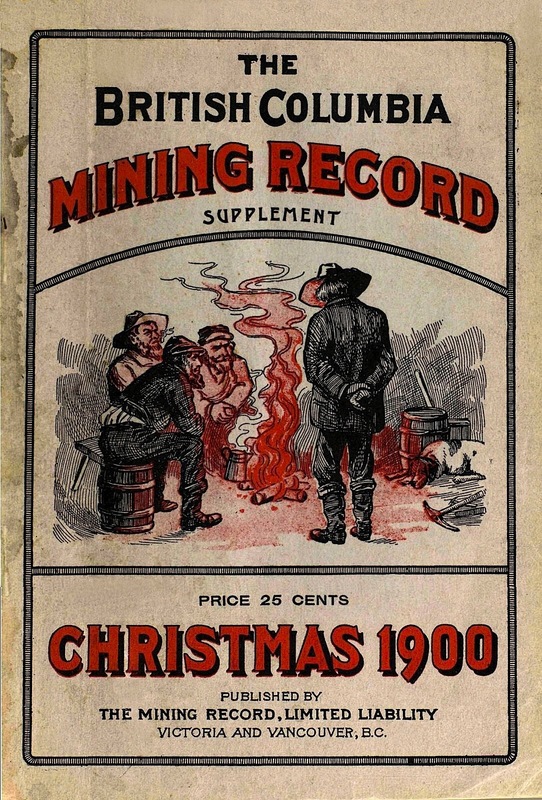 Mining towns sprang up all over the place and newspapers “on wheels” followed them. IN PRINT. The first printing presses in the Kootenay’s, one belonging to R.T. Lowery, were two old American army models sent over the mountains by mule in 1893. John Houston used a rowboat to float an army press from Bonner’s Ferry, Idaho to Nelson, B.C., where he started a newspaper, called The Miner, followed by The Tribune. 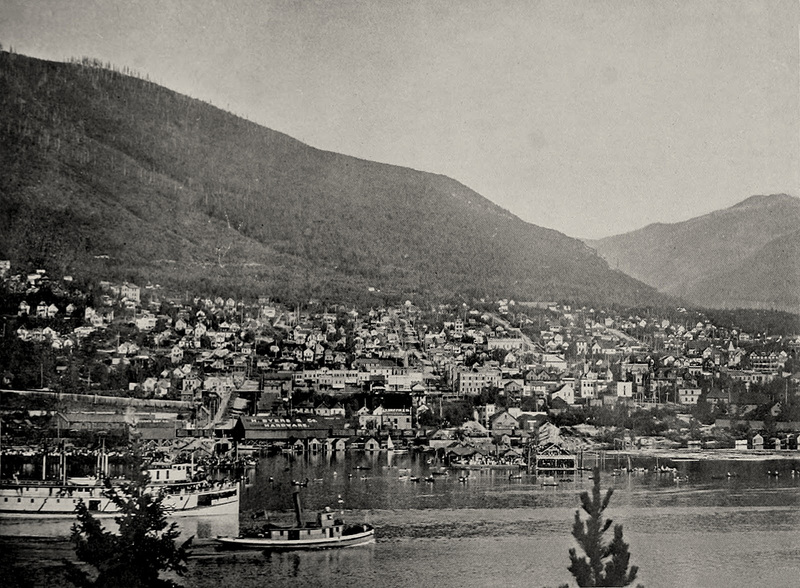 His press claimed to have published the first newspapers at Kaslo and Slocan City. 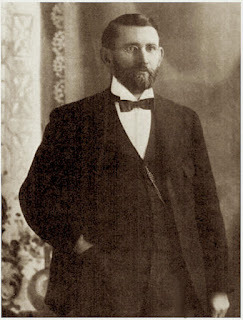 Houston and his foreman, Colonel Charles Ink, started the Nelson Miner newspaper on June 21, 1890. John Houston would become the first mayor of Nelson, B.C. in 1897. Also living in Nelson at the time was Colonel E.S. Topping, the American born founder of Trail, B.C. “Colonel” Robert Thornton Lowery, newspaper editor, publisher, financier and tramp printer was born in Ontario on April 12, 1856, where he started a newspaper called the Petrolia Topic. 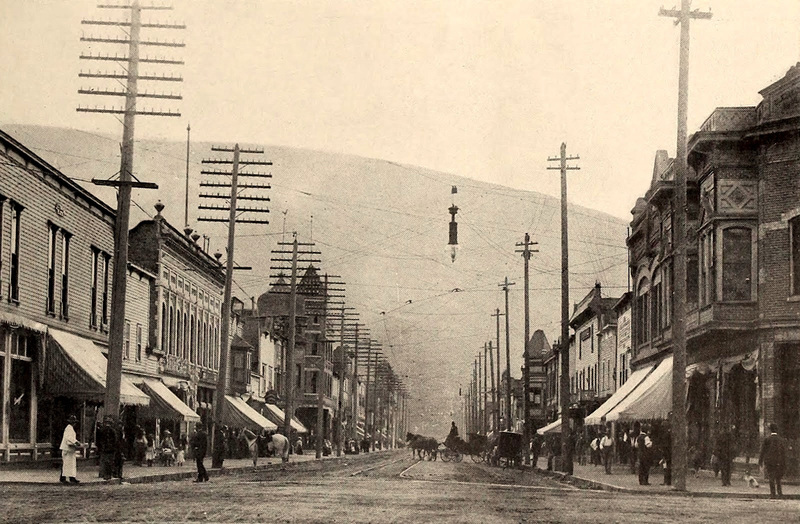 After a brief ownership he sold out and arrived at the Kootenay silver district of British Columbia in 1893. Buying a Washington Press and metal type fonts he began his boomtown newspaper career at Kaslo, B.C. 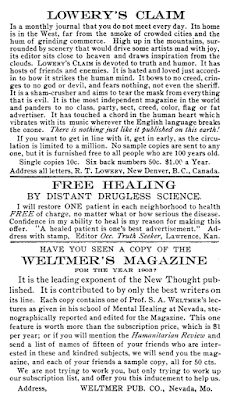 with a weekly Freethought journal titled Lowery’s Claim, founded in 1893. 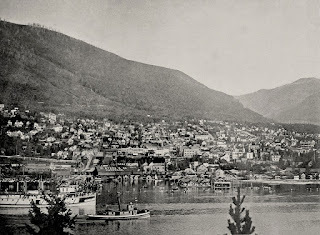 Kaslo was situated on the west shore of Kootenay Lake, once known as Flat Bow Lake. 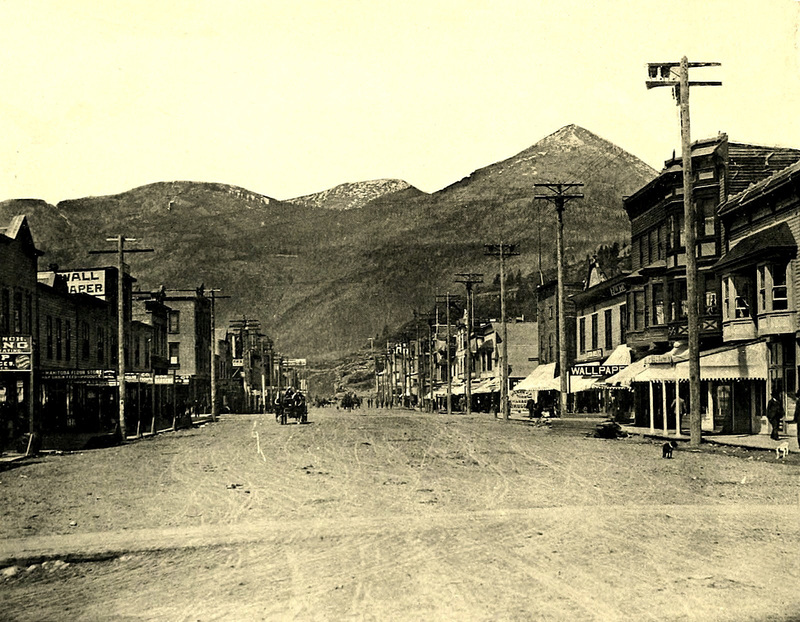 A fall in silver prices and a shuttered bank put an early end to the Kaslo Claim. Kaslo is a thoroughly American mining town, and consequently it is not altogether the peaceful and prosperous hamlet that might be met with in the farming districts of Ontario. It is a busy bustling place with more saloons than there appears at first sight to be any necessity for. The streets are roughly graded, in many the stumps of trees and huge rocks are left standing. REAL PAPERS. 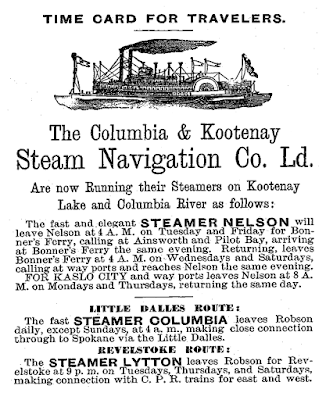 After he left Kaslo “Colonel” Lowery moved on to Nakusp, B.C. 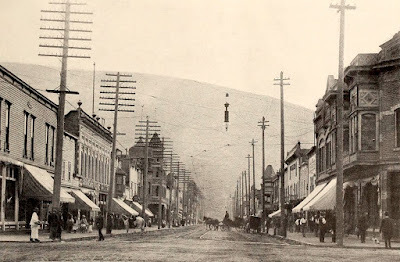 where he published a real newspaper called The Ledge, beginning October 5, 1893, puffed ever after as “the oldest mining camp paper in British Columbia.” The Ledge was published out of New Denver between June 6, 1895, and December 29, 1898. Lowery recruited a newcomer to New Denver, one Jim Grier, as his printer’s devil. He started a handful of other newspapers; the Sandon Paystreak (1896), The Slocan Drill (April 5, 1900), and the Poplar Nugget (Dec 4, 1903). 1905  The Ledge, March 1. 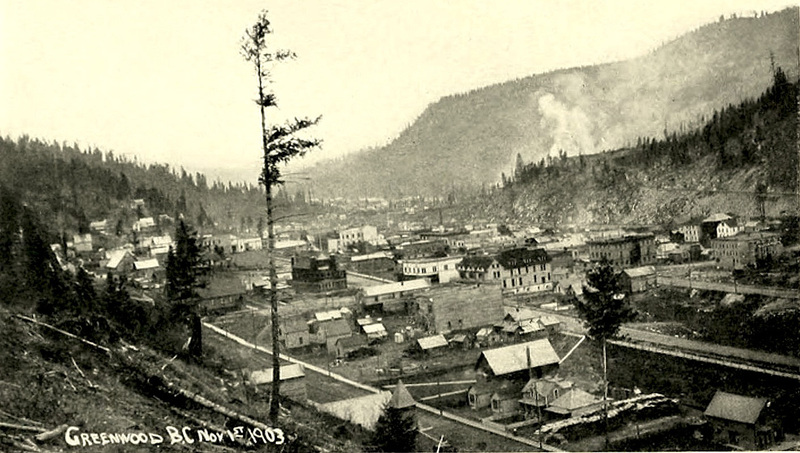 For seven years, from 1897 to 1904, it was our good fortune to live in the Slocan and to be a co-worker with “Colonel” Lowery. We look back upon those days as a time never to be forgotten. 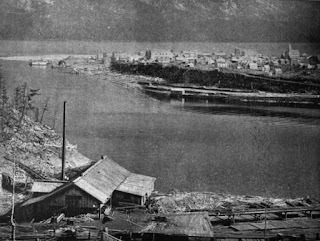 It was in the boom days of the Silvery Slocan, the heyday of poker and blackjack, of wine and Scotch, and the strenuous life in the oldest profession on earth (…) If “wine and women” meant sin and noise and frolic mean hell, then hell “broke loose” frequently in the Lowery days of the Silvery Slocan, and the Lord must have loved it for we had so much of it (…) and these were the days, this the atmosphere wherein Col. Lowery lived at peace with his fellows and the universe. His greatest trouble was in escaping from the wiles of the wealthy widow that ever pursued him, for he was a bachelor and had no children. In those days we printed at the Ledge office, New Denver, in addition to the Ledge itself – an 8-page seven-column newspaper – the inside pages of the Lardeau “Eagle,” then run by Johnny Langstaff (now in the Customs’ Office at Vernon), and of the Sandon Paystreak, and also put out monthly Lowery’s Claim, a magazine which for a time created some noise, but was finally ruled out of the mails by puny post office officials more pious than prayerful. 20th C. With the new century the old mining towns were rapidly filling up with pious politicians, pastors, business men and their families. Drinking, gambling and even Sunday fishing became subject to the new blue laws. At this period Lowery was at his most vigorous in attacking the religionists and political authorities. In December 1901 the Canadian Pacific Railway boycotted Lowery’s Claim, banishing newsvendors from selling it on the trains. Worse was to come. ATTACKS. 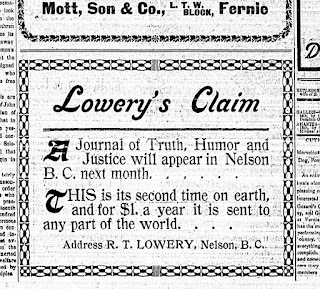 On January 13, 1902 the Post Office department prohibited Lowery’s Claim from transmission by post on the grounds that it “contained articles offending against decency and good morals.” The ban lasted through 1903 but, luckily, Lowery ran another Kootenay newspaper, The Ledge, published at New Denver at the time, and used it as a pulpit to attack the Post Office while appealing. Meanwhile he published another humorous magazine, The Ozonogram, out of Vancouver. Lowery’s Claim was reinstated on the promise of future good behavior. TRAMPING THE COUNTRY. 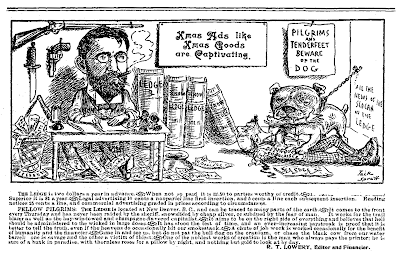 Lowery, suffering ill-health, temporarily suspended publication in June 1902 and after a holiday in Ontario returned to the Kootenay’s to begin a long period of peripatetic publishing. With his subscription list in his pocket, Lowery tramped the country with a printer’s devil, publishing “on wheels” from every mining town wherever he happened to be. 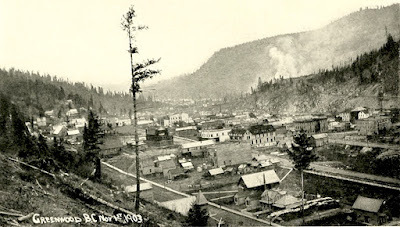 From late 1901 until 1906 he was publishing both The Ledge and Lowery’s Claim from a whirlwind of West Kootenay towns; Kaslo, Slocan City, Nakusp, Sandon, New Denver, Enderby, Nelson, Rossland, Fernie, Greenwood and Grand Forks. In 1903 he was temporarily publishing at Vancouver, B.C. The office of LOWERY’S CLAIM is in a pleasant locality, one where the sun shines, the birds sing, and the cows do not break in and steal. It is within a few yards of a bank, church, saloon, coffee mill, coffin emporium, and the office of a dynamite factory. It is bounded on the east by a potato patch, on the west by a sidewalk, on the north by a brass band college, while to the south the Board of Trade building silently stands guard, like a stranded ship in still water. 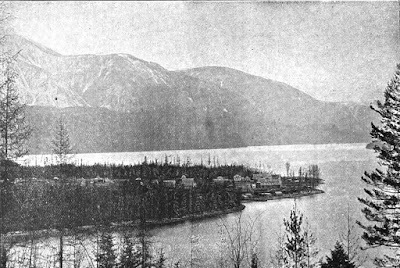 — The Claim Office, in Lowery’s Claim, October, 1905, Nelson, B.C. FINES. The Lord’s Day Act was passed on July 12, 1906, regulating the movement of railways, vessels and buying and selling on Sundays. Sunday games and contests were banned outright, punishable by $10 fines. OBSCENE. Lowery began a sustained attack on politics and religion in the Claim’s pages. He also spoke a little too frankly of sexuality in its pages. After reading Lowery’s Claim, no. 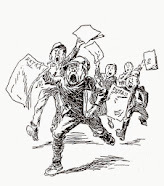 35, July 1906, the post office declared the articles “of a low order, most of them being indecent and obscene” and barred use of the mail once again. 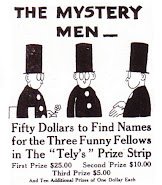 The last number was issued on September, 1906, from Nelson, B.C. Confucius said: “Do not do to others what you do not want them to do to yourself.” Five hundred years later Christ said: “As ye would that men should do unto you, even so do ye also unto them.” All of which proves that master minds often have similar thoughts, even when centuries intervene, and the Associated Press was still unborn. Owing to ill-health and being shut out of the mails, I will suspend the Claim. Liberty is dying in Canada; it is the only country on earth that refuses me the use of the mails. Twenty years ago Col. Lowry started The Ledge at Nakusp, when the place was a red hot railway construction camp and it required four policemen to keep order. The Ledge and the Colonel have been located in several places since then, but Greenwood will probably be their abode for some time to come. The Colonel is one of the last of the real old time Kootenay publishers, John Houston, F.J. Deane, Col. Egan, Charlie Ink and some of the others having gone to push clouds with the angels, as the Col. himself would put it. ENDING. 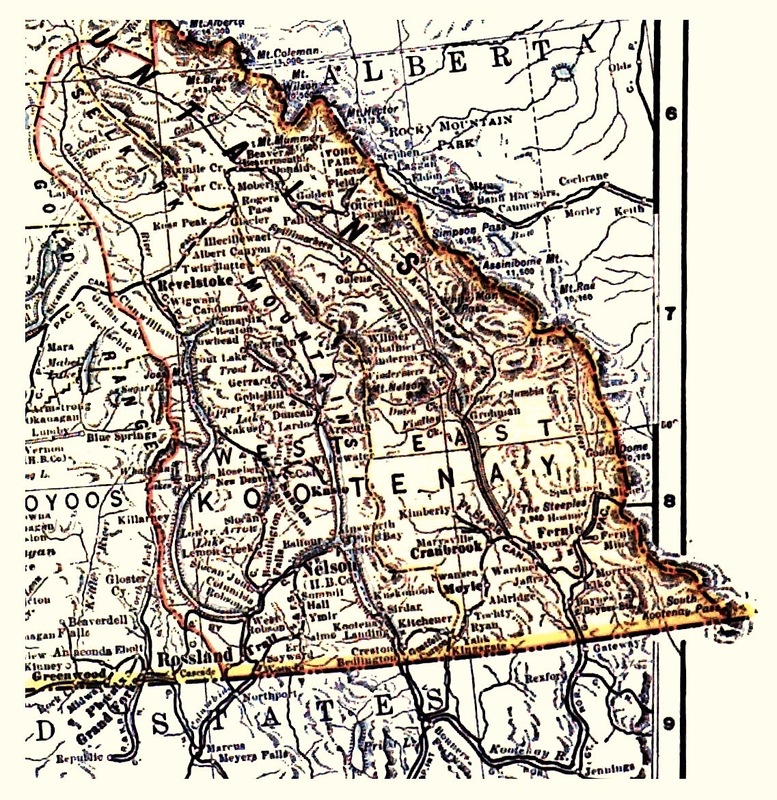 The final home to Lowery was Greenwood, known as the “Boundary,” where his old printer’s devil from New Denver, James Grier, helped run The Ledge. 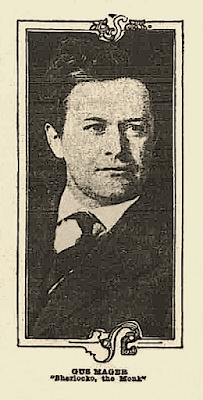 Lowery settled in, spending winters in California for health reasons and publishing The Ledge until 1920. 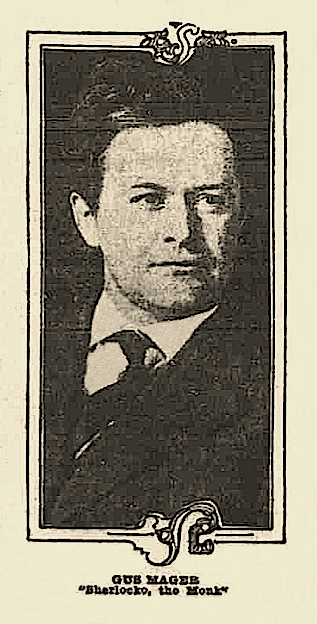 He was also financier and owner of the Similkameen Star, published at Princeton in 1914-18. ‘Colonel’ Robert Thornton Lowery died of Bright’s disease at the Grand Forks, B.C. hospital on Friday, May 20, 1921, aged 65. On May 24 a number of his Greenwood associates and his brother Samuel accompanied his remains to “his favorite town” at Nelson, B.C., and laid him to rest. The funeral was held under the supervision of the old-timers’ association of British Columbia. 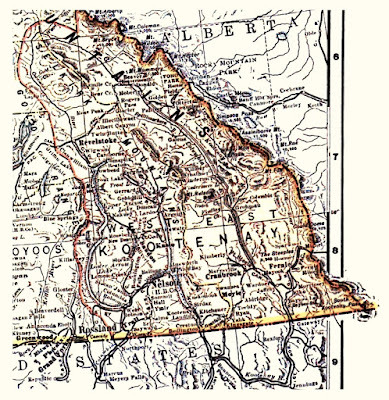 1900  Map of the Kootenays. c.1890  Portrait of R.T. Lowery. A TRIBUTE TO A DOG. — The print shop in New Denver is tinged with gloom. Jim Grier has lost his dog Pete. It is feared that the beautiful animal may have fallen down the chute of a sausage mill or been borrowed from some pirate from Silverton. Pete was a perfect canine picture, with a classical face, and a sad, far away expression in his limpid eyes. He might have been a sunflower before reincarnation dumped him into the Lucerne of America. Pete was a talented dog, and could eat a chunk of liver without using a fork or saying grace. He was honest and never touched any of the pie in the office, licked the paste, nor chewed the roller composition. He was not big enough to eat delinquent subscribers, but he could chase a chicken a mile without losing his dignity. Pete had a musical strain; his nightly singing to Luna was just as sweet as the rendition of Home Sweet Home in Gaelic. However, like a fallen star Pete has “went,” the towel hangs on the knob of the print shop door, and the neighborhood is blanketed by a wide ledge of silent gloom.